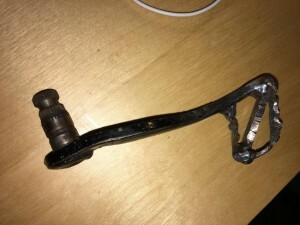 We would like to thank Jeff of Commercial Tool & Die for fixing Belka’s (1987 Honda TLR200 Reflex) rear brake pedal! 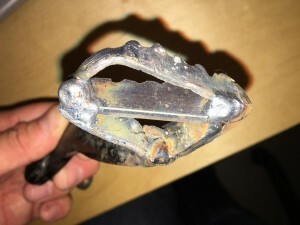 Hawk accidentally dropped it on tarmac from a standstill and the pedal got bent and cracked. The pedal saw lots of cracks before during Hawk’s practice in rock gardens. 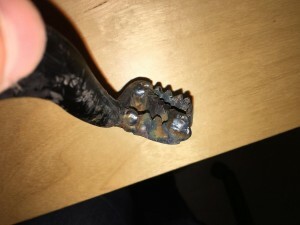 So the pedal was weak and beaten up. 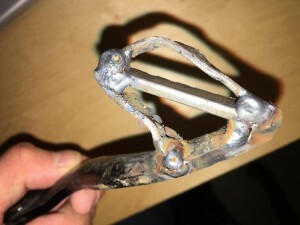 Jeff took a step further and welded in a special diagonal reinforcing element inside the pedal itself. He even made teeth in it! What an amazing work! Give him a call at (540) 364-3922 if you need something to get fixed.